Be advised, I am not suggesting that you bench any of these QBs with Peyton Manning, Russell Wilson, and Andy Dalton on BYE weeks (OK, maybe Newton). This is just information to know heading into your Week 4 matchup. Also, some of these defenses are not great against the pass, just terrible at stopping the ground game. Luck has been the best fantasy football QB this season, and the Titans are 1-2 with bad losses to the Cowboys and Bengals in back to back weeks. However, they do not get beat in the air, but on the ground. The Chiefs, Cowboys and Bengals have averaged 134 rushing yards per game against the Titans, compared to just 170 passing yards. But hey, maybe Luck can catch a TD pass like Andy Dalton did last week! No team has allowed less fantasy points to the opposing QB. Will be interesting to see if this is the game Trent Richardson finally breaks out, or if Ahmad Bradshaw officially takes over. Rodgers has given fantasy owners headaches early on with 2 poor performances against the Seahawks and Lions, failing to pass for 200 yards. In his defense, both of those defenses are pretty darn good. Unfortunately for him, he faces yet another strong pass defense in the Bears Week 4. The Bears have an interception in each game, 1 vs Bills (E.J. Manuel), 2 vs Jets (Geno Smith) and 3 vs 49ers (Colin Kapernick) and allowed a single TD to each QB. Playing back to back divisional games is tough for any team, but the NFC North is a special rivalry. Rodgers has already been sacked 9 times, 3rd most, tied with Ryan Tannehill, behind Chad Henne (15) and Alex Smith (11). Bears Willie Young leads the NFL in sacks with 4. If Matt Ryan is going to play inconsistent football this season, Week 4 could be a dud. Week 1 and Week 3 combined have seen Ryan complete 52 of 67 (77%) pass attempts for 734 yards and 6 TDs, 0 INT against the Saints and Bucs. Week 2 he was limited to 24 of 44 (54%) for 231 yards 1 TD and 3 INT against the Bengals. The Vikings are terrible and have allowed 50 points to the Patriots and Saints the last 2 weeks, but Tom Brady and Drew Brees combined for just 442 yards and 3 TDs (2 for Brees). They attempted 69 run plays for 258 rushing yards. Cutler has been great for fantasy owners early on, not only with his 8 TDs, but handing Brandon Marshall 3 on Sunday Night Football and Martellus Bennett 2 on Monday Night Football. But Matt Forte has gone missing and that could be a huge problem in a game with the Packers. Marshall's ankle was an issue again on Monday Night (he did return), so who knows how healthy he will be come Sunday, although he did catch his 3 TDs with a bum ankle. Green Bay is 1-2 with losses to the Seahawks and Lions, and in those 2 games, allowed over 300 rushing yards and 3 TDs, 2 to Marshawn Lynch. If the Bears want to control the game, they will have to take advantage of a bad run defense and give Forte a heavy workload. The Packers secondary picked off Matthew Stafford twice and Geno Smith once. 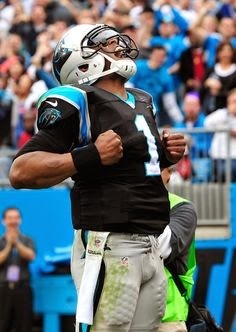 Newton has been just OK in his 2 starts, completing 66.7% of his 69 attempts for 531 yards, 2 TDs and 0 INT. He has gained just 26 yards on the ground so you can eliminate that from the equation until he proves himself healthy. The Ravens have allowed just 2 TDs to Andy Dalton (1) and Brian Hoyer (1), while shutting out Ben Roethlisberger. Add to that, the Panthers have no healthy running backs with DeAngelo Williams, Jonathan Stewart and Mike Tolbert all injured, I wouldn't be surprised if the Ravens beg the Panthers to run the football. If you have a replacement QB already on your roster, you might want to consider using him!